For general lighting purpose in shops, offices, houses, schools etc. Single phase a.c. supply is commonly used. Hence instead of d.c. motors, the motors which work on single phase a.c. supply are very popularly in use. These a.c. motors are called single phase induction motors. The numerous domestic applications use single phase motors. The power rating of such motors is very small. Some of them are even fractional horse power motors, which are used in applications like small toys, small fans, hair dryers etc. This chapter explains the construction, working principle and applications of various types of single phase induction motors. Similar to a d.c. motor, single phase induction motor has basically two main parts.one rotating and other stationary. 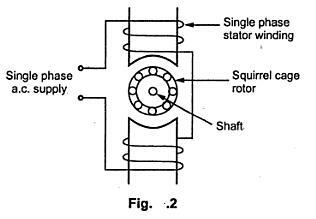 The stationary part in single phase induction motors is called stator while the rotating part is called rotor. The induction motor never rotates with the synchronous speed but rotates at a speed which is slightly less than the synchronous speed. The schematic representation of two pole single phase induction motor is shown in the Fig.2.